When “Twinklebear” Lesley Maclean and I met (“met” in this life—“reunited” is more accurate, since we are reincarnated mates, from past lives), there was an instant FLASH! A conflagration was instantly ignited, as we “recognized” each other, although the conscious moment was ill-defined for us both. There was a vague knowing of each other, a vestigial memory, stored in our respective soul memory banks, that bespoke of earlier eras and perhaps, far away places. The unspoken feeling was…. The soulmate community would refer to Twinklebear and me at this point in time, as “unawakened.” Unawakened soulmates are defined in this community, as soulmates who are not yet spiritually awakened to the fact, of their soulmate connection to each other. Their recognition of each other might be misconstrued very non-spiritually, as merely sexual or personal attraction to each other. This is understandable, particularly for like people like us, who had never done much reading about the subject. As you will see later, we were actually at an advantage, because of our ignorance regarding soulmate community dogma, and the terminology bandied about in this community, regarding the soulmate phenomenon. All Twinklebear and I knew, was that we were extremely attracted to each other, although inordinately so, to an intensely high degree. We could not know, and did not know the inevitability of this: that our mutual attraction was based on past living and loving with each other, that bred what would ultimately turn out to be an unbreakable soulmate bond. As we became more “awakened” and the barriers of resistance fell, we began to sense a truly special bond. A bond so close, that it had to have existed for decades, if not centuries or even millennia. The result of this “awakening,” was fear. It was fear on the unknown, of this amorphous, but undeniable need for each other. It didn’t make sense. We were both afraid that we were falling, crazy, mad in love, and there was the helpless feeling—that we could do nothing to stop it! Our respective reaction was…. It has a nice, platonic, innocuous sound to it, doesn’t it? “Kindred spirits” brings to mind, people who enjoy the same hobby, like stamp collecting, or the same interest in a favorite football team. Through our judicious use of language, we tried to minimize our bond. What put the lie to this willful denial, and attempted minimization of the truth, was our incessant need to be with and talk to each other, every available minute, of every day! This insatiable need for closeness, has been there from day one. This constant exposure to each other of course, merely strengthened our bonding, and made this inevitable bond more apparent, to our disbelieving and denying minds. We were in deep trouble! Ha! But, as evolving soulmate relationships go, we became closer every day. There came a point, where we realized that we were “soulmates,” and began to refer to each other this way. There were many glaring and blaring signs of this fact. We would say and think the same thoughts, simultaneously. We would know what emotion the other was feeling, without any direct communication about this. We would feel each other’s pains, in the same body areas at the same time. We exactly completed the other soulmate, as if we were both of the same mind and soul. This latter in fact, is what defines “twin flames” in theory. There is clearly some exclusivity to being twin flames. A twin flame can have many soulmates of various degrees of closeness, from relatives to friends—but twin flames only have each other, as their twin flame partners. Three’s a crowd, baby! Twin flames also have the reincarnation market cornered. Since the beginning of time, twin flame partners strove to reunite in different lifetimes. It was only quite recently that Twinklebear and I began to investigate the soulmate community as a matter of curiosity, as represented in Facebook groups, and on individual internet websites. We found, that unencumbered by preexisting knowledge of what constituted twin flame relationships (as described by those already in the soulmate community), that we quite serendipitously discovered what we were. Which are each other’s twin flame partner. We came by this knowledge that we are twin flames, not because we were susceptible to the power of suggestion rendered by the information found on soulmate community websites, but by experiencing acknowledged twin flame parameters, on our own. We did this unsullied by preconceptions. What we found on Facebook soulmate groups, was there were many in those groups that had been exposed to the definition of “twin flames” as prescribed by the “experts” at the groups—who were subsequently searching for their twin flame partners. We felt that there was the slight tinge of “trendiness” at these groups. Hey man, “twin flames” were in! Status symbolism lives! It seemed that everybody and his brother/sister, were either looking for a twin flame partner, or who experienced disappointment in ex or current lovers, who they believed were their twin flame partners. 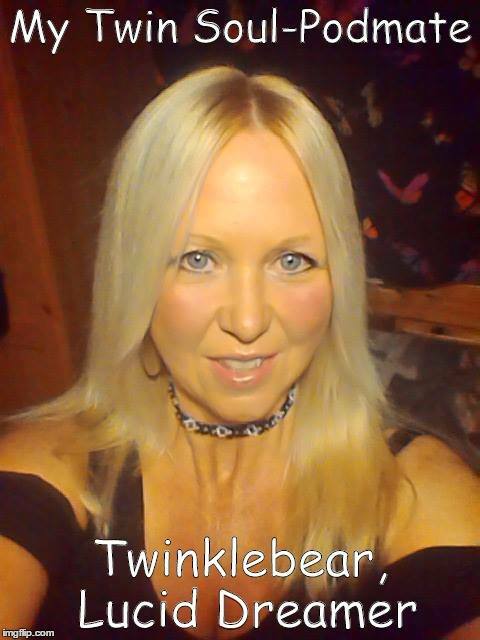 Because of the trendiness factor these days, in being in a twin flame relationship, both Twinklebear and I don’t like the “twin flame” term. One way that Twinklbear and I are similar as so-called “twin flames” is, that we are both rebellious by nature. We are both the “baby of the family.” We are both the youngest of four siblings. That fact that we are both non-conformists, may explain our aversion to the “twin flame” label. Because of our independent natures, we feel more comfortable with two terms that we feel are more appropriate than the mega-trendy “twin flame”, for what we feel—is our very rare and highly intense soulmate relationship. We believe that our soulmate relationship is very rare. These preferred terms are “Super Soulmates” and “Twin Soulmates.” I admit a personal preference for the latter. The former certainly alludes to the rarefied status of our relationship, in a nicely technical way. “Twin Soulmates” succinctly, and simply states what we are—which is the twin souls type of soulmate relationship. I won’t even get into what “podmates” are, because that would just cloud the issue of accurate descriptive terminology. You see, words do matter. Such an intuitive and perceptive article my Sookybear. Wow! What a journey it is so far. We are so intune. Our thoughts, feelings, ailments, all. The early denial was ( if you think of it) so silly! Yet, so typical of ” twin souls ” or ” Supersoulmates”as we like to be known as. It is certainly so rare , that of which we do share.